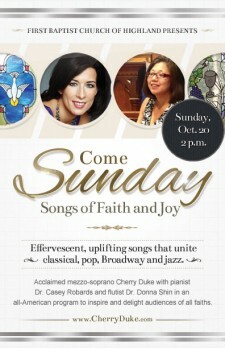 An afternoon concert of effervescent, uplifting songs that unite classical, pop, Broadway and jazz. Including songs by Ricky Ian Gordon, Jake Heggie, David Sisco, John Bucchino and Duke Ellington. Notes: Concert with Casey Robards, piano and Donna Shin, flute.